The Vatican City State is the smallest independent state in the world ,it boasts the smallest number of citizens (900) and with its 110 acres it is most definitely the smallest country. What’s in a name? Vatican probably comes from vaticination or to foresee, the high priest would climb the Vatican Hill on the right shore of the river Tiber to look at the sky for answers. When Rome was in its heyday the emperor Caligula built a stadium where many Christians were killed, among them Saint Peter crucified under Nero in 64AD. The Vatican Museums house one of the richest art collections of the world , from ancient art (Greek, Egyptian, Roman) to contemporary art. Focus on the Renaissance art with the masterpieces of the leading artists of the time: the Raphael Rooms and Michelangelo’s Sistine Chapel. The Raphael Rooms used to be the residence of Pope Julius II and many more popes. Raphael frescoed the papal apartments with the help of his students, his true masterpiece being the School of Athens. At the tail end of the fifteen century Pope Sixtus IV wished to refurbish the ancient Palatine Chapel and he chose the best painters of the time: Pietro Perugino, Sandro Botticelli, Domenico Ghirlandaio, Cosimo Rosselli and their workshops. The Sistine Chapel, which was named after Pope Sixtus, was inaugurated on August 15th on the year 1483. 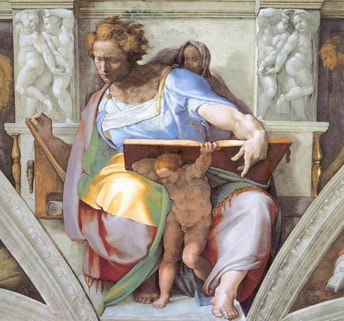 Michelangelo then took over working in the Sistine Chapel for several years frescoing the ceiling with stories from the Genesis and the altar wall with the Last Judgement. St. Peter’s Basilica and the Papal tombs : built upon the tomb of St. Peter and also the place of his martyrdom, the Basilica it’s the outcome of over a century’s work, and the brainchild of many artists. Inside it we find one of Michelangelo‘s early works: the Pietà, which he made at 24. Bernini’s Baldachin and Papal chair. Then St.Peter’s Square: the heart of the religious activities is the true expression of the Roman baroque.